Alan Partridge is to make his BBC comeback at 9.30pm on February 25, the broadcaster has announced. In This Time With Alan Partridge, Steve Coogan’s hapless hosts takes the reins of a One-Show style magazine show. He takes over alongside Jennie Gresham, played by Susannah Fielding, after the main presenter falls ill.
Felicity Montagu reprises her role as his assistant Lynn, while Tim Key is back as Simon Denton, formerly known as ‘Sidekick Simon’ from Mid Morning Matters. Earlier this week the BBC released a 40-second teaser clip of Alan’s return. 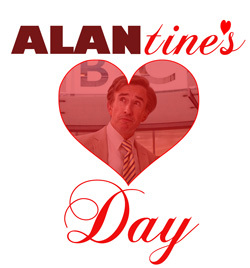 And in honour of today’s news, Chortle will be celebrating ‘Alantines Day’ with a number of stories and features about Partridge’s impending return.